Hello everyone and welcome back! If you recall, recently, I made a few new purchases which I featured in my Mini Haul post about a month ago, that have dramatically made a difference in my skincare routine. 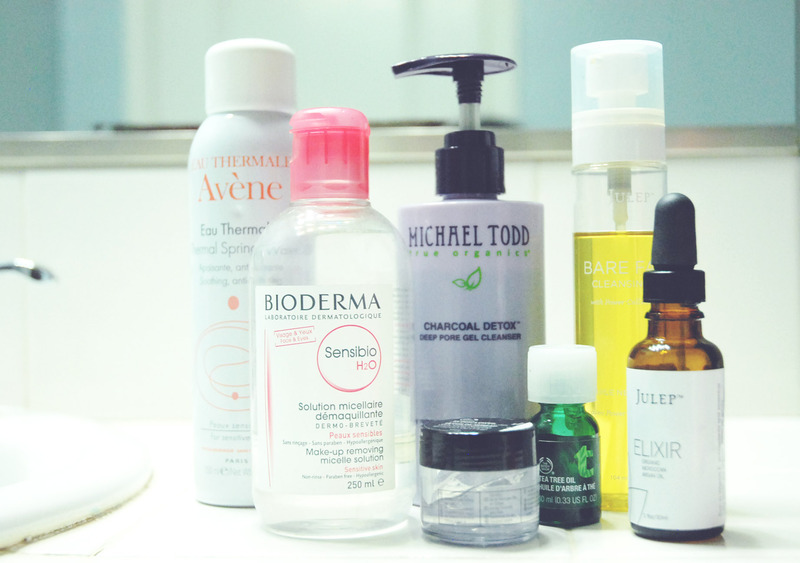 In fact, the original title I had in mind for this post was “How to Wake Up With Better Skin”, because honestly when I take the time to properly and thoroughly carry out all the steps in this routine I truly do wake up with better looking skin. My spots are reduced in size and redness, the congestion on my face is lessened, and my skin is left moisturized and plump in the morning. Just a note, I have oily to combination skin that is prone to acne. Stress and hormones are big triggers for my acne. Some of the products I mention may not be suitable for your skin type, and I will be sure to make notes accordingly. 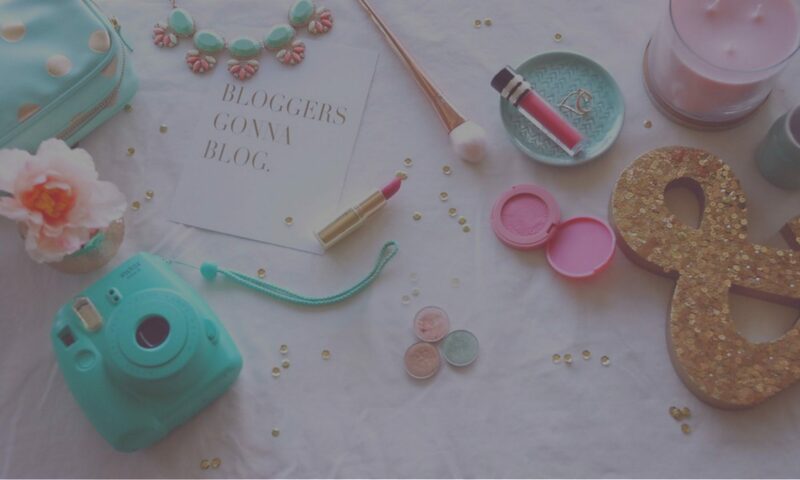 If you are unsure about how to find your skin type or want to brush up on your skincare basics, I have a post on that here. Also, this is my ideal everyday skincare routine, however I admittedly do not perform all of these extensive steps everyday. Sometimes I eliminate steps for efficiency, or add masks and treatments to supplement for large breakouts, etc. This routine is not set, but rather fluid and can be easily modified. For generalization purposes, though, this is the jist of it. This routine is best for the night as it uses heavy, oil based products which are best absorbed overnight into the skin. If you are worried about using oil based products on oily skin, you shouldn’t be! Oil based products actually help balance the skin and their presence eliminates the need for the skin to produce “bad” oil naturally, if that makes sense. 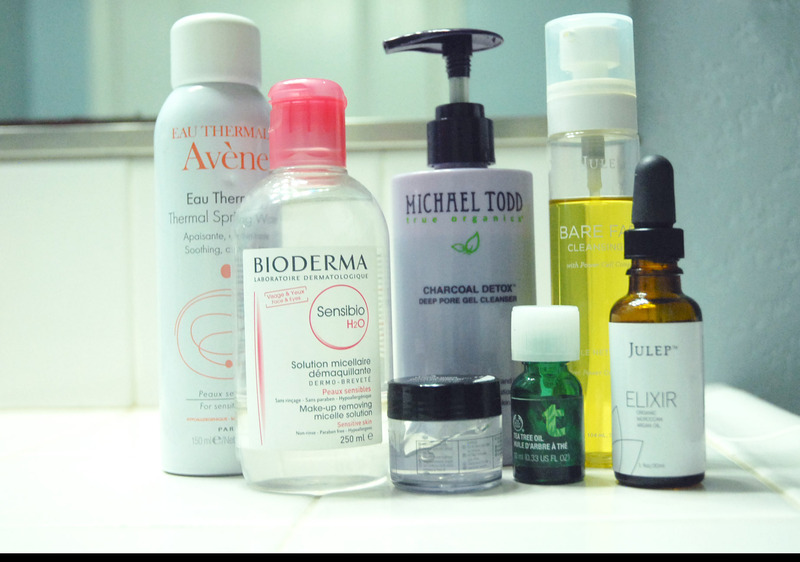 Anyhow, the main point is I have separate routines, including an alternate morning skincare routine, which I can make a later post on if you would like. Leave me a comment below if you’re interested! Without further ado, let’s get started! Removing your makeup is essential. I cannot stress this enough. If you wear makeup, you should always remove it by the end of the night! There’s my two second rant. Anyway, to remove my makeup I use the Julep Bare Face Cleansing Oil per recommendation of Claire Marshall which I picked up during my last haul. I don’t want this to get too review-y, but I’m still on the fence about this. I do prefer this over wipes. It does remove more than a wipe and cuts down on waste since I’m not disposing of so many towelettes. It removes makeup pretty well, however I find that it struggles with eye makeup particularly. In addition, although this product has lasted me a while (I’ve been using this for about a month and I have plenty left) you do need a good amount to remove a full face of makeup. However, I digress, but I take 2-3 pumps of this just on my face & neck to remove foundation on a normal day, but if I’m wearing a heavy foundation I’ll take 3-4 pumps. After, I’ll massage 1-2 pumps over my eyes gently for normal days or 2-3 pumps for more eye makeup. Once the oil is worked over my face, I rinse it away with warm water. It lathers away and removes most, if not all, of my makeup. This product is good for most skin types. Yes, this is a half step. I wrote it in because I only use a micellar water on an as needed basis. If I have leftover eye makeup or any makeup at all, I’ll take a bit of this on a cotton round and quickly remove any remaining bits of makeup. 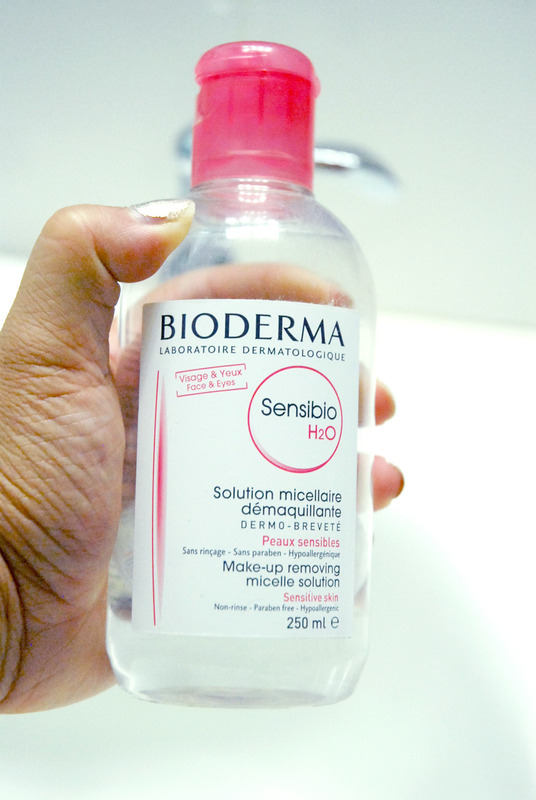 Bioderma is my favorite cleansing water, however I have a review on a few different options here. This product is good for all skin types. 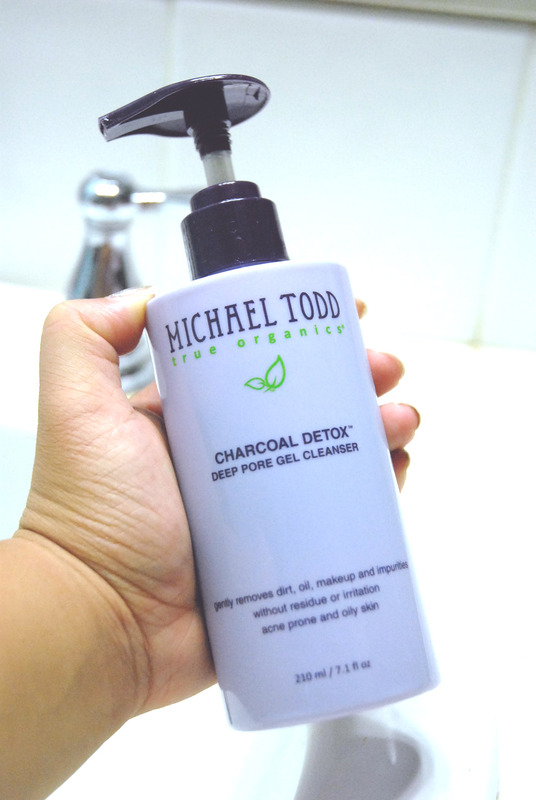 I apply a half pump of this Michael Todd True Organics Charcoal Detox Cleanser * to damp skin and work it to a lather. Then, I let it sit while I brush my teeth. After I’ve finished brushing my teeth I rinse off the product and dry my face off with a clean towel. I make sure to use a clean towel every time so that more dirt does not transfer back to my face after I’ve already washed it. I love this stuff and you can read more about the details of it here! If you would like to purchase this product or any other Michael Todd skincare, you can use this link to receive 20% off your purchase! This product is best for combination to oily skin types. To find a cleanser that works for a different skin type, refer to this post. I defer to Caroline Hirons for all my skincare needs, and according to her, all treatments should be applied before moisturizer so that they can be absorbed into the skin with it. For spot treating, I use The Body Shop Tea Tree Oil on my blemishes. I apply a little of this to a Q-tip and dab over any spots that I have. I find that this product reduces inflammation, dries out the zit (without drying out the skin and causing it to flake), and has anti-microbial properties which help the zits from getting infected from cross contamination. I’m no skincare expert, but from experience, this stuff is highly potent and I would strongly suggest that this product is suitable for oily and blemish prone skin. It can be drying so I would not recommend for dry skin. I don’t particularly have prominent darkness or circles under my eyes but when I need extra hydration or am feeling particularly tired and/or responsible for my skin, I’ll apply some eye gel gently with my ring finger under my eye. This is The Body Shop Elderflower Eye Gel. 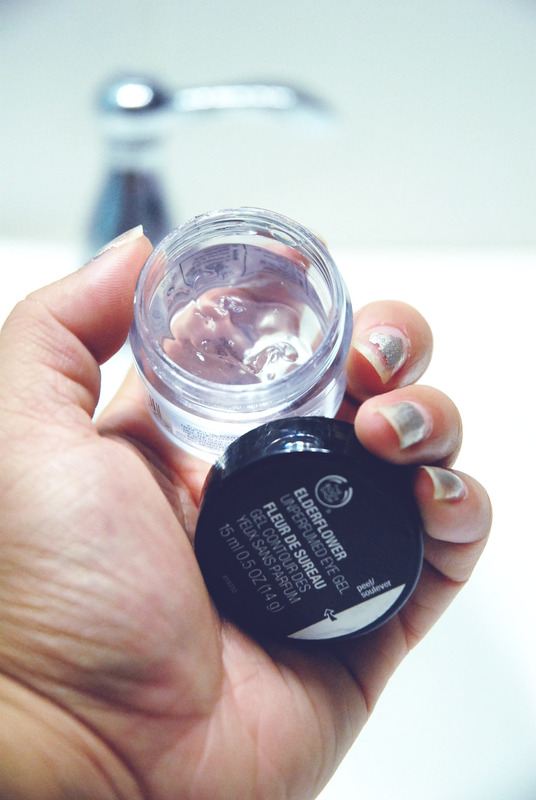 It’s very light and gets the job done, making it the perfect beginner eye gel! This product is suitable for all skin types, however might not be effective for all. If you have more under eye issues, you might want to consider something more nourishing. I use pure argan oil to moisturize my face. 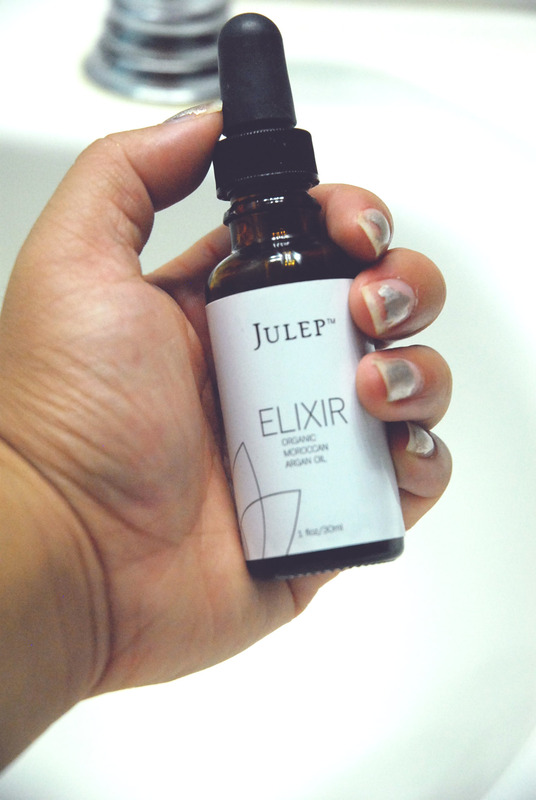 I’m currently using Julep Elixir and this is already my second bottle. I love this stuff! Facial oils are great for balancing out the bad oils that your skin produces naturally and are super nourishing. I take a full pump and start by massaging over my neck and décolleté, if I’m feeling particularly motivated to keep my skin youthful. After, I’ll take what’s left and massage it into my face. A little goes a long way with this product. This product is best for most skin types. I finish off with a bit of “toner”. The quotation marks here are because this is technically not a toner, but a pH balancing mineral water spray. 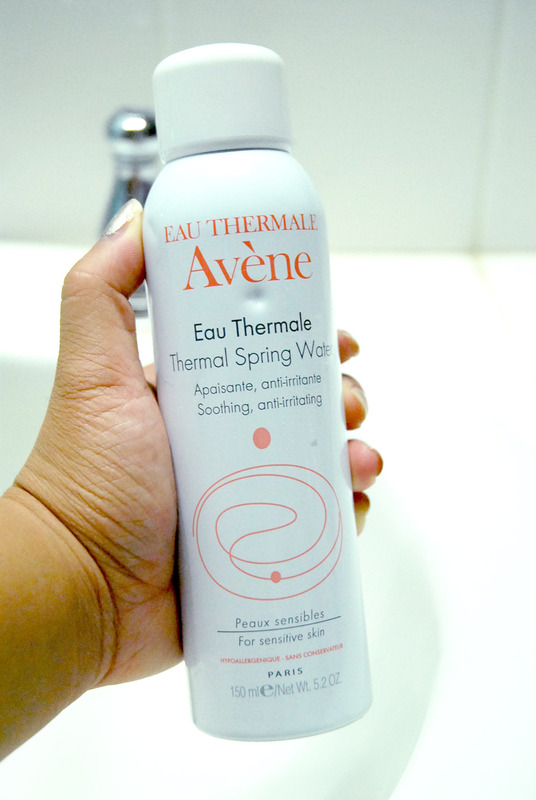 This is the Avène Thermal Spring Water. It’s French and I absolutely adore French skincare. insert heart eyes emoji here. Anyway, it is perfect for refreshing the skin and locking in all of the nourishing skincare so that it absorbs well overnight. It is also good for irritated skin after shaving or waxing. This product is good for all skin types, but especially sensitive! That’s a wrap! I hope that you found this helpful and if you have any questions feel free to leave them below! *disclaimer: This post is not sponsored by Michael Todd. Product was purchased with my own money, however at a discounted price using my affiliation code. All opinions are my own.